You simply apply SoilMend to your lawn and/or garden. 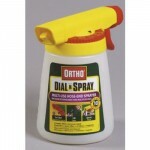 Use a hose end applicator designed for liquids. 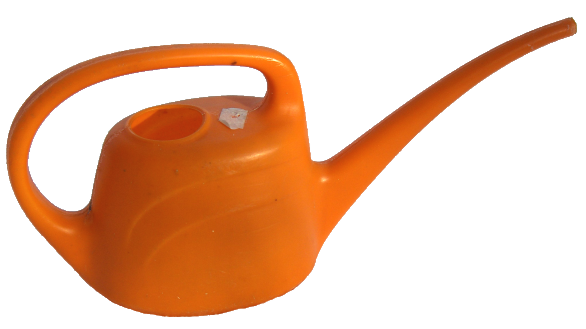 After you have applied SoilMend, water the garden or lawn for a few minutes to wash it into the soil. SoilMend can be applied where plants are growing, and although it will not harm your plants it is best to wash it off of the plants into the soil where the benefits can occur. Repeating applications of SoilMend can result in accumulated improvements to your soil the first year you use it. You can repeat applications every 4 to 6 weeks if desired. After the first year one treatment annually should keep your soil energetic and productive. Unlike other liquid fertilizers and amendments that give you a dilution amount or setting on a sprayer, SoilMend is applied based on the size of the area you would like to treat. 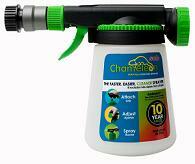 Many hose end applicators come with general instructions for applying other fertilizers. Disregard the instructions that come with the sprayer when applying SoilMend. Some soils can have their beneficial biology greatly reduced. This can damage soil structure. SoilMend can help restore soil structure of formerly productive soil to the level it once was. 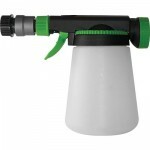 First, you need a hose end applicator designed to measure and apply liquids. 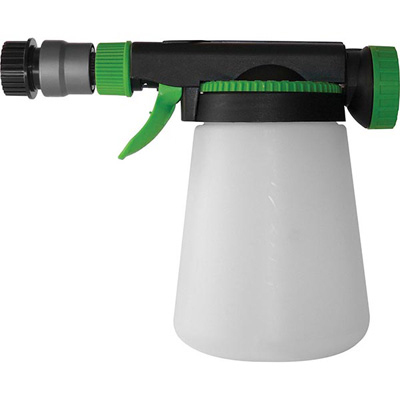 Spray applicators for dissolving powders (like Miracle Gro) will not evenly distribute liquids. 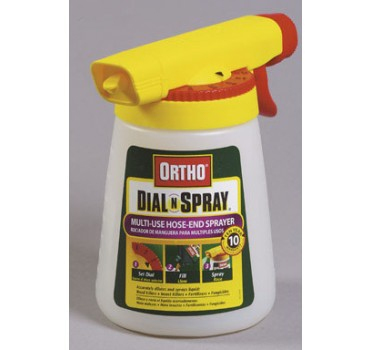 Applicators for liquids are available at many of the big box hardware stores, many local hardware stores and many nurseries. You can also order online from internet retailers such as Amazon.com. SoilMend is an inexpensive liquid amendment that is easy to apply directly to your lawn, garden or around your trees and shrubs. A single application will provide improvement to your soil but we recommend applying SoilMend 4 or 5 times during the first year of use for accumulated improvement to your unproductive soil. After that apply SoilMend once a year (spring or fall) to keep your soil productive. Microbial improvement of the soil can be sustained for longer periods of time than other soil amendments. Repeated use can make improvements to your soil especially the first year. After that one application per year will help maintain improvements you have made in the soil. SoilMend can be applied when temperatures are hot or cool even while it is raining. Soils that were once productive can become unproductive through neglect, misuse, change of use, or abuse (usually unintentionally). SoilMend helps restore the environment of the soil transforming it back to its formerly productive state. SoilMend is safe for pets and kids when it is applied as directed. 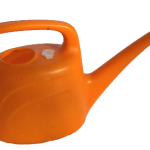 Apply SoilMend to your garden or lawn using a hose end applicator and then wash it into the soil after each application with your sprinklers. SoilMend can be applied any time of year even in hot and cool temperatures. If your soil has become unproductive now is the best time to apply SoilMend. SoilMend can be applied even in hot temperatures and will still help improve the soil. We recommend applying it during the cooler part of the day, typically mornings are best. Summer heat can get to a point that it stresses grass and other plants even though biological activity is increasing and soil conditions are improving. The first year you use SoilMend, especially if you start in the heat of the summer, even though it may appear as if you are not getting much results SoilMend can be working to improve the soil even in sweltering heat. In subsequent years the summer heat should not be as much of an issue. Part of the problem with unproductive soil can be caused by excessive applications of fertilizer. SoilMend helps process unused fertilizer bound in the soil and improve the efficiency of the fertilizer you use. SoilMend is all natural consisting of naturally occurring ingredients including a proprietary blend of organic acids, beneficial soil microbes, organic carbon, nitrogen and sulfur. You can mix SoilMend and some of our other soil amendment products such as SoilEnliven together and apply them at the same time. When a soil becomes unproductive soil pH can become out of balance. SoilMend can help increase microbial activity and help drive soil pH toward back toward neutral. SoilMend was designed to be used to improve soil that has become unproductive whether it is used for crop growth, vegetable gardens, lawns, shrubs, flowers and trees.